Next to losing ‘wood’, nothing is quite as terrifying to a man as losing his hair. A thick thatch has long, if erroneously, been associated with both masculinity and virility. A full head of hair is related to neither, of course, but that doesn’t stop men fretting about their follicles. So much so that a recent survey found that over 70 per cent of men worry about hair loss. Problem is, lots of things conspire to rob your scalp of it’s most precious asset. Male pattern baldness, the hereditary condition that’s responsible for 95 per cent of hair loss in men, will affect up to half us by the time we hit 50 and almost 40 per cent of men will have experienced some hair loss by the age of 35. Some men’s hair will begin to disappear at the crown; others will start to notice that hair at the front is receding; while some unfortunate guys will see both areas affected at the same time. “The pattern depends on which hair follicles are genetically programmed with receptors to DHT (dihydrotestosterone) – the hormone which triggers hair loss,” explains trichologist Sally-Ann Tarver from The Cotswold Trichology Centre and Theradome GB. “Where you start to loose your hair is down to the genes you inherited from your parents – and genes of both mother and father are inherited in male pattern baldness,” she says, putting to bed the myth that baldness is inherited solely from your mum’s side. Other factors like stress, rough handling and diet can take their toll on the thickness of your thatch too. “As well as male pattern baldness, men can suffer from Telogen Effluvium or ‘diffuse hair loss’, which is often due to lifestyle and health issues.” This can be caused by anything from stress and illness to poor diet and nutrient deficiency. A man can live without a quiff, of course, and a lack of hair never held back the likes of Patrick Stewart or Jason Statham. What’s more, women don’t find it the turn off men think it is either: in a recent survey by WatchMyWallet.co.uk 84 per cent of women claimed that hair loss would not affect how attracted they were to their partner. But if you’re not yet ready to embrace the pate, here’s everything you can do to thicken, disguise and style out thinning hair. Foods rich in B vitamins, zinc and iron (like breakfast cereals, liver and apricots) and silica (bananas and – handily – beer) are especially good for hair health. “People with hair loss caused by issues other than male pattern baldness are often deficient in vitamins B12,” says Tarver, who points out that a supplement may be especially important for vegetarians since dietary B12 can only be obtained from animal sources. If you’re worried your diet’s below par, think about popping a daily supplement aimed at promoting hair health like Wellman’s Hairfollic Man. If you have thinning hair, choosing the right styling products is crucial. “It’s worth avoiding heavy products like clays, gels and pomades and instead opting for mousse on wet hair and texturising powders on dry hair to finish,” says Georgie Wynes-Devlin of The Wild Hare barber in London, who uses Redken’s Full Effect Mousse to plump up hair and the same brand’s Powder Grip to style very fine hair. Dandruff isn’t just a danger to your rep – according to Tarver it can exacerbate hair loss too. “Dandruff is often seen alongside male pattern baldness and healthy hair cannot grow from an unhealthy scalp. So if you’re worried about hair loss, it’s a good idea to ensure your scalp remains as free from scale as possible,” says Tarver. To keep your scalp a flake-free zone, use a shampoo containing anti-dandruff agents like zinc pyrithione or ketoconazole and don’t be afraid to use them regularly. Many men worry frequent shampooing will accelerate hair loss because they spot stray hairs on the shower, but we naturally shed between 40-100 hairs a day and shampooing can actually help minimise hair loss by removing grease, grime and dead cells that can interfere with follicle function. As if ashtray breath, cancer and honking clothes weren’t good enough reasons to pack in the ciggies, a study by National Taiwan University revealed that smoking also hastens hair loss in men. Researchers discovered that men who smoke more than 20 cigarettes a day are more than twice as likely to have moderate or severe hair loss than men who have never smoked or have quit. The boffins who conducted the study suspect that smoking may damage the blood vessels at the base of hair follicles, effectively starving your hair of nutrients. There are scores of snake oil-style treatments for hair loss on the market but Regaine is the only clinically proven over-the-counter treatment for hereditary hair loss. It works thanks to an active ingredient called minoxidil, which increases blood flow around the hair follicles and by stimulating and prolonging hair growth. It doesn’t work for everyone (Regaine themselves suggest giving up treatment if you’ve haven’t seen any results after using their Extra Strength Foam for 16 weeks) and it’s best to start treatment as soon as you notice hair is thinning, but it’s still the best everyday option on the market. The down side is that it’s expensive (a year’s supply of foam will set you back around £172) and you’ll be using it for life because the minute you stop your hair loss will revert back to normal. The other option is Propecia: a prescription-only treatment in the shape of a tablet containing finasteride, which hinders the body’s ability to convert testosterone into the dihydrotestosterone. It’s even more expensive than Regaine (a year’s supply will cost you over £350), you’ll have to take it for as long as you want hair, and known side effects include a reduced libido – which may knock your confidence even more than the hair loss. When Wayne Rooney tweeted, “Just to confirm to all my followers I have had a hair transplant”, back in 2011 he changed how men viewed hair transplants forever. In proudly outing himself on the follicle front he made having a transplant no more outlandish than having your teeth whitened. So mainstream are transplants now that according to a survey by Asda Pharmacy, 31 per cent of men under 35 are actively considering one. The most common treatment (and the one favoured by Rooney) is Follicular Unit Extraction: a minimally invasive procedure performed with a local anaesthetic where individual shafts of hair are taken from the sides and back of the head (or chest if need be) and are transplanted into existing, vacant hair follicles. The procedure itself takes anywhere between four and 16 hours to complete (thousands of individual hairs have to be re-homed after all), will cost you anywhere between £3,000 – £10,000+ depending on the number of grafts required, and occasionally repeat transplants are required for hairs that don’t take. In the same way that dressing in dark colours and matt fabrics can disguise a little extra poundage, the right hairstyle can go a long way to disguising a follically-challenged thatch. If hair loss is a problem your first port of call should be your barber. “A skilled barber will conduct a thorough consultation to help you to understand how you can make the most of your existing hairstyle or suggest a restyle that absolutely owns that receding hairline,” says Tyler Peters, from the Shoreditch branch of barber chain Ruffians. Here are four universally recommended hairstyles for a receding hairline. A style that’s seen a resurgence in popularity in recent years, even with guys who don’t ‘need’ it, the French crop is the perfect style for combatting the ‘M’ shape a receding hairline creates at the front of your head. “This is an idea for those whose recession line hasn’t crept up too much and allows you a bit more versatility by maintaining a little length on the sides with a bit more on top,” says Peters. If you want to avoid too-short a buzz cut she suggests asking your barber to scissor cut your hair instead. “Clippers can produce too harsh a cut sometimes, so it’s always best to do these things gradually.” Dropping the length towards the nape will provide a softer, more natural finish. Sometimes, the only way to deal with going thin on top is to accept defeat and embrace being bald. “If you’re going for a head shave, book in with a skilled barber confident with a cutthroat razor to take your hair to the scalp,” says Peters. If you just looked in the mirror and noticed your hair isn’t quite as thick as it used to be, here are some quick ways to make it look a little fuller. Blow-drying instantly makes hair look fuller and thicker. Don’t BBQ your hair though – a medium heat setting will allow you to style without damaging hair’s structural proteins. Thickening shampoos work by coating the hair with special volumising polymers that make it appear thicker and fuller. The effects are temporary but every little helps, right? If a small bald patch is a problem try disguising it with the help of electrostatically charged coloured fibres, which mesh with your real hair to fill in any noticeable gaps. Repeatedly combing thin hair can make it look limp and flat whereas styling with your fingers adds volume and texture. Facial hair is brilliant at drawing attention away from the top of the head and down towards the face. It’s a bit like pointing at the sky and asking “What’s that?” when you want to distract someone long enough to zip up your flies. Try growing a beard. Beards are badass. Neroli Fragrances: An Expert Guide Hit all the right notes and refresh your cologne collection with a lighter touch of class The Man Bun Guide: What Is It & How Do You Wear It? 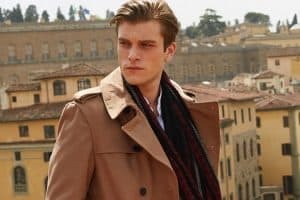 It could be time to give this polarising hairstyle a second chance Male Body Image: The Naked Truth Be honest, how happy are you with your body?